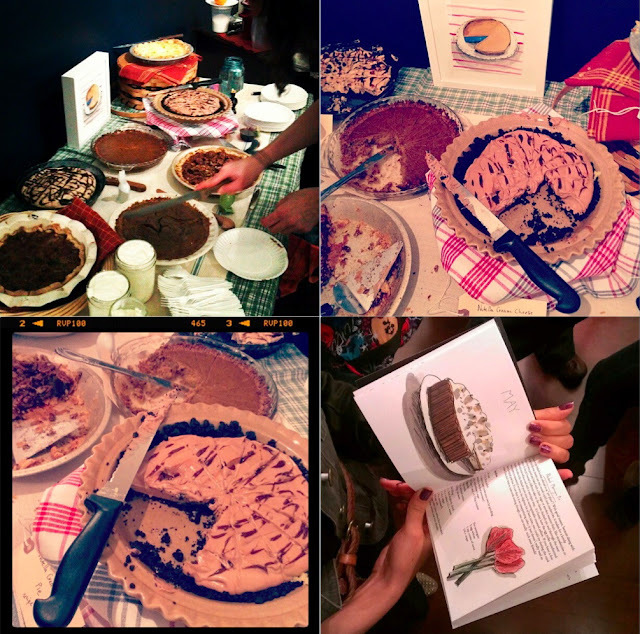 Nothing in the House: Pie Almanac Release Party! Our Pie Almanac Release Party last night at Ginger Root was SO. MUCH. FUN! Except for one film shot of Diego (pictured in the Speculoos PEZ previously) eating the last crumbs of the Nutella Pie with a big smirk on his face, I only took pictures of pie, but the above Instagrams by Grant Dickie, Morgan of Panda Head and Carla of TPWP can help set the scene. It was really wonderful to see so many friends, and meet lots of new ones, all of whom were so encouraging and supportive and pumped on pie and pie art. Elizabeth and I want to extend a very big thank you to the Ginger Root gals for hosting us in their lovely space, DJ Dianamatic for playing awesome jams, and everyone who came, bought a book, sampled pie, or said hello. I even had two pals, Annie & Diego who drove all the way from Charlottesville! That little surprise made me feel really good. If you missed the party, you can still order the almanac on Etsy here, where you can also find more of Elizabeth Graeber's work, like the framed pie prints pictured here! The almanac is now also for sale at local shops including Ginger Root and Meeps-- We'll keep you posted as they appear other places. Thanks again to everyone for their support and happy pie making! Labels: Bittersweet Chocolate Pecan Pie, nutella icebox pie, pie almanac, pie art, PIE. A Hand Drawn Almanac, shaker lemon pie, Speculoos Pie, spiced pumpkin sorghum pie, sweet potato speculoos pie, Washington D.C.
was so fun! let's have more pie parties. Pi(e) Day party on March 14th!! !